In the final session of the first day of the Media Lab’s spring meeting, Lab director Joi Ito introduced the council of advisors that are helping him shape his thinking about the Media Lab as the new director. Before bringing the advisors to the stage, Joi asked, “What matters most to us as a community?” The community is a thing with concentric rings, it’s a pretty vague word. In the narrow circle of faculty meetings, the Media Lab faculty came to a rough agreement about what makes the Lab special. The answer was “Uniqueness, Impact, and Magic”. At the Media Lab, Joi tells us, we’re really good at uniqueness and magic, and we’re pretty good at impact, but I think it’s an area where we can improve. So Joi created a Council to spend a day thinking about impact and asked them to share their ideas with us. His advisors include John Seely Brown, June Cohen, Peter Gabriel, Seth Godin, Reid Hoffman, Alberto Ibarguen, Michelle Kydd Lee, Jennifer McCrea, Susan Schuman, Jeff Walker, Keith Yamashita. 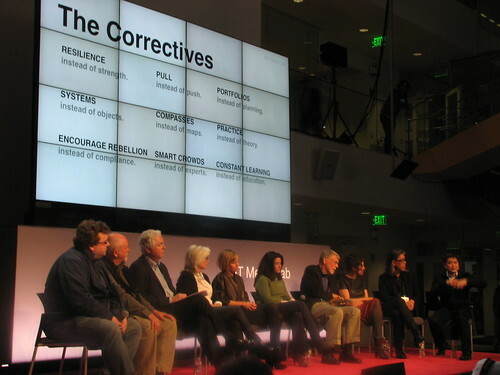 Joi points to some of their particular strengths and expertise: John Seely Brown’s experience leading Xerox PARC, June Cohen’s efforts to turn TED from a conference into a media brand, Alberto Ibarguen’s deep understanding of media through his work with the Miami Herald and now with the Knight Foundation. Peter Gabriel is introduced as Joi’s mentor on the topic of wisdom. The advisors were asked to tackle a challenging question: How do we improve impact in the real world especially in the networked world? June suggests that if you want to deepen your impact, you need to create a larger circle of belonging. To do that, you need to break down walls and let more people in. At the same time, you have to do that so that people on the inside don’t feel like their losing something. Joy ismportant – “what is the sense of passion that we can bring to the world and use to connect with others?” John Seeley Brown observes that many people prefer to give a gift than to get a gift. What you’re doing at the Media Lab is giving gifts to the world, an act that brings great joy. “You’re giving gifts of possibility and gifts of imagination to others.” Reid Hoffman reflects on the idea that acts of creation aren’t just artifacts of technology but new ways of being. Making Media is about asking about the meaning of life, a question that includes joy and pain and suffering and why we’re here. Keith Yamashita points out that Peter Gabriel, who often meets with The Elders, could add some wisdom into this equation. Gabriel reflects that we have opportunities that our species has never had before. There’s both incredible possibility and extraordinary dangers running in parallel. Perhaps there’s something outside of existing institutions and power centers that can be given to the world. Invention occurs in many places in the world, and it’s central to the vision of the Lab. There are a lot of people who love what we do at the lab and who want to be part of it in the world. Jeff Walker thinks it’s important to get groups together to ask the hard questions rather than just focusing on finding the best answers. Could the Media Lab create a list of the five best questions and invite people to focus on those questions. Jennifer McCrea, a fundraiser who’s raised hundreds of millions of dollars for worthy projects, belives that there are ample resources to get all the work we need to get done in this world. But it often stays inactive because of the barriers we put up. We often keep an arms-length distance from the work we’re doing. We show up once a year, we don’t ask questions. That’s a client relationship — a fragile relationship of people leaning on each other. The idea of the consortium is much more powerful as we stand together. A< HREF="http://en.wikipedia.org/wiki/Reid_Hoffman">Reid Hoffman points out that the key to innovation is a dense network where projects happen at a fast speed. The Media Lab is a very dense network which doesn’t just happen within the lab’s building, but also through the tools, techniques, ideas, and questions that we spread around the world. On open networks, ideas can spread quickly so everyone can participate on some level and networks can form/ reform to develop the right things. Michelle Kydd Lee, who leads the CAA Foundation, encouraged us to think about what’s going on in the outside world. She spends most of her time among pop culture makers. Some are thrilled to be stimulated by the Media Lab and translate what we’re doing to different constituencies. There are a lot of communities who need to know that the magic is there for them if they can work hard. June Cohen talks about the journey of TED over the last five years. Until five years ago, TED was a small elite conference. They chose to open their talks to the world by sharing videos online, then having people translate the talks online, and then inviting people to translate the talks. They currently host 12000 talks online. A million people watch the talks each day. There are 5-8 TED talks each day. You would think people would be thrilled, but that’s not always the case. People often have an instinct to keep things to themselves. Despite this, the benefits are amazing. TED has gone from an organisation that reaches a thousand people a year into an organisation that can draw involvement from all over the world. This requires letting go of a sense that you’re the only organization that can run a TED talk – you need to reach beyond who you already know to find wonderful speakers in Kenya, Sierra Leone or Rajasthan, and finding those thinkers will push your organization in new and wonderful directions. John Seeley Brown thinks we’re reliving something that we have lived twice before: Cambrian moments, moments during which almost all the species we know came into being at around the same time. He thinks that another new world is coming into existence now. As we see this incredible range of possibilities, we have never had such a moment where small things could lead to big changes. If everything is getting disrupted as is now happened, people have a pssion for doing things differently and rethinking the game from the bottom up. This is the moment where we can imagine new worlds– perhaps something which is even more important than creativity. Writers and musicians have made imagined worlds for a long time; we have an opportunity to knit together imagined worlds in new ways in this golden moment. People all over the world, from the high tech to the wonderfully creative low tech can imagine things in new ways. Keith Yamashita asks how advisors can help. How can we put a booster rocket on this? What are our paths forward? How do you make things radically open and try to reach billions of people? June thinks that it’s often frightening to open an organisation. We often plan for all the things that could go wrong. Planning for success requires us to look for the people who really want to get in and find a structured way for them to contribute. Jeff Walker thinks the Media Lab is a vibrant node in a great network of alumni, members, and partners. Could we teach people how to be great networkers and collaborators? Susan Schuman wonders what would it look like to have a Kickstarter for MIT? How could we put the MIT Media Lab out into the world? John Seely Brown reminds us that the Media Lab represents the combination of head and hands. The brain is an embodied mind that runs through everything. Can we teach 7 billion people through every kid’s passion to make something? Who else has done more than the Media Lab to extend the maker philosophy? Joi points out that developing a maker society isn’t just about a bigger Maker Faire. It’s all about giving people the freedom to create. Joi asks us, how do we do that? We know how to do a lot of the technology and tell the story of that. When you try to create a world of 7 billion teachers, you have to think about other things. At the moment, we don’t have a lot of ways for people to become a movement that is the Media Lab. One of the ideas is: could we create a Media Lab Fellows movement, or a network of Media Lab Makers who work out of public libraries in different parts of the world? Joi admits this is a page stolen out of TED’s playbook – TED has used fellowship programs to increase the diversity of people involved with their community. Beyond fellows, Joi wonders how we could extend our identity into a movement – how could people feel like they’re part of a movement, part of our team working to change the world around ideas like “everyday Edison” or “seven billion teachers”. While doing this it’s important to make every person a part of the movement and not just a consumer of it. Yamashita points out that the Media Lab is prestigious and populist at the same time. What might we offer to applicants who aren’t admitted to the lab but who still share our values and ideas? Peter Gabriel suggests that excellence is another key value. One of the ways excellence comes into play is through curation – the Media Lab may want to think of itself as curating amazing contributors and ideas from around the world. Joi explained the reasons for open research. Directed research often involves the easiest problems. We want people’s really hard problems. We could collect problems from members, and narrow down the top problems. Once we’ve got these hard problems, we work to turn solving them into a movement. Jeff points out that we also need entrepreneurs and funding to experiment and develop ways to get those ideas out into the world. One audience member, who has been a member of the lab for 10 years mentions that she feels a bit like a dinosaur. She’s wondering what her company can do. Joi responds by saying that we can work together to develop more a feeling of community and convene diversity. As we bring together that diversity, the ability of companies to achieve what they want in the world can be amplified. New companies shouldn’t be looking for a solution to a specific business problem– but look for the really big ideas that will change their work. That can feel negative, but we can work together to help figure out how to respond to disruption. The Media Lab is still going to be good at the great gadgets and IP. But companies are worried less and less about individual technologies; they care much more about the system. Throughout its history, the Media Lab often takes a contrarian line. Sponsors will often say to him that they can point to billion dollar decisions they made a different moments in their history as a result of something they saw in the Media Lab. The advisors weigh in with a wealth of advice for the former sponsors, now members. Reid Hoffman thinks that companies should see themselves as participating in open networks. Networks have communication on problems and solutions that flow in two directions. Members should go beyond the “innovation show” to identify key ideas that matter. Michelle Kydd Lee asks members to embrace openness, to understand that we’re going through change, and to embrace it, and encourages us to “remember the magic” of discovering this place for the first time – if you’re having trouble doing that, she suggests, go upstairs and play with the LEGOs. John Seely Brown points out that most of the people in this event are edge dwellers in their organisations. This is the first time that the Media Lab has recorded and broadcast its member event. He encourages people to find the things that touched them and discuss that immediately with the people at their company. Jeff Walker notes that members of the lab now have new partners – they can call Reid Hoffman or Peter Gabriel. “How cool is that?” Susan Schumann notes that the companies who sponsor the lab tend to be large and powerful ones – it’s possible that this spirit of openness and networks could affect those businesses in the long run, spreading from the lab outward. A member from Saudi Aramco observes that the problems they’re trying to solve are very complex. Might we look at systems of problems as well as individual problems? Joi points to Reid’s insights on framing problems: the way you frame the problem is half the process of solving it. If you go to a gastroenterologist to solve a stomach ache, you may miss discovering that the cure for your problem is meditation – by defining a problem as a stomach problem, you may overdetermine a solution. That’s where a diverse organisation makes a difference. It’s often the people who aren’t used to solving the problems who offer creative ideas. Reid comments that to deploy networks to solve problems you need to learn how to share the problem in a good way. Joi notes that he wasn’t sure that a group of such busy and important people would really be able to turn into “a thing”. Reid notes that it’s not a thing, but a network. Joi asks us all to welcome our advisors into our network and our wider community.